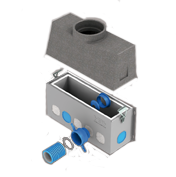 M&G offer Multiline as the leading PP-flue system for multiple boiler installations. 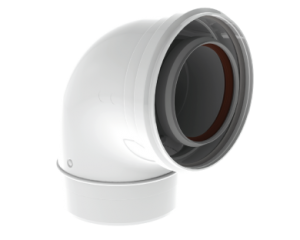 This technically advanced condensing cascade system, otherwise known as ‘common flue’, is the ultimate system for any commercial application. 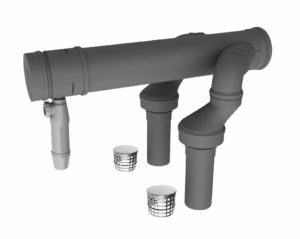 Multiline can be adapted to any installation whether it is a horizontal system ‘cascade’ or a vertical system ‘shared flue system’. It is versatile, robust and can be easily applied to any cascade set-up of condensing appliances. This versatile all-round system is perfect for line set-ups, back to back set-ups and double line set-ups. This reliable cascade system is a secured and long lasting system. 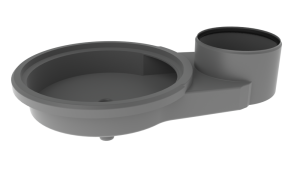 It has a modular construction and is pressure tight. The PP materials used are light-weight, easy to install and fit together perfectly. The sustainable high-performance materials are resistant to condensation and tested for long-life durability. Furthermore they are safe and clean with no corrosion sensitive materials, which means less pollution in the high efficiency boiler. The high quality injection moulded parts and smooth inner wall ensures optimal flow quality. The Multiline cascade system comes in one kit that is quick and easy to install. As an added advantage, M&G offer 150 non-return valve to stop flue gas entering an inactive boiler from an active boiler. This ultimate system has the perfect combination of flexibility, energy efficiency and the latest technology to ensure a powerful commercial heating system capable of satisfying even the largest of demands.